Welcome to a brief and spicy talk about Rocoto in Peruvian Restaurants. We’re going to talk about what it actually is and the way you can find it. This conversation is about to get hot, so sit back and enjoy (Remember we are still in the Gourmet Cuisine arena!). What’s the Rocoto and what’s its use in Peruvian cuisine? So let’s warm up to the fascinating world of Rocoto. (I love this hot stuff puns, my bad…). Its technical name is Capsicum Pubescens (something like “Hairy Pepper” because of its hairy leaves). It might be more recognized as a Peruvian pepper, but its origins can be traced all along the Pacific coast of South and Central America. There are different types of Capsicum Pubescens. There are the “Orange” the “Canario” (yellow), the “Rocoto Longo” (from the Canary Islands), the “Rojo” (Red one) and the “Peron” (it looks like a pear). Among other, we can list the Ají Mongo, Chile de Caballo, Turbo Pube, among others. The Rocoto in Peruvian Restaurants also gets different names depending on who you ask. Ask a Mexican, and they will call it “Chile Manzano” (Apple Pepper). It is also known as “Locoto” in Argentina and Bolivia. Its seeds can be very dark or even black, which is one of its main features. The Rocoto also grows violet/blueish flowers. This Pepper can be found in Peruvian chicken markets, and in Argentinian, Bolivian, Ecuadorian, and Mexican markets as well. The Rocoto in Peruvian Restaurants is mainly used in the recipes for traditional dishes. Among them, we can find the “Rocoto Relleno,” (we will talk about it later), or the Ceviche. Even when one of its main spicy ingredients is the “Ají Limo,” it’s not unusual to find Rocoto in Ceviche dishes. It can also be found in stews, mixed with onions, garlic, and oil. Peruvian Restaurants like Inka are also known to use Rocoto in salads to accompany several traditional peruvian dishes recipes. A glance into a famous dish:Rocoto in peruvian restaurants! One of the most famous uses of Rocoto in Peruvian Restaurants or traditional family recipes alike is the Rocoto Relleno. Straight from the city of Arequipa, this dish is one of the most renowned Peruvian dishes recipes inside the country and abroad as well. You can definitely find it in a Peruvian restaurant in Miami Beach, or somewhere else. for first time tryiersBut hear me out, first of all, do not mistake the ingredients in this dish with red bell peppers; you might get a fiery surprise! It is so hot that if not boiled, it can be ten times as hot as a jalapeño! The Peruvian Rocoto Relleno is an entrée that, besides the rocoto of course, includes a filling of chopped meat (sirloin), pork, eggs, peas, fresh white cheese, margarine, and potatoes. On the spices side, you can expect to find garlic, and onions. As if it wouldn’t be spicy enough, the Rocoto Relleno also has Aji Panca, the Peruvian Red Pepper! (That’s right, time to call the fire department!). Among other ingredients you can find vegetable oil, tomato sauce and white wine, evaporated milk, mozzarella, and parmesan cheese. 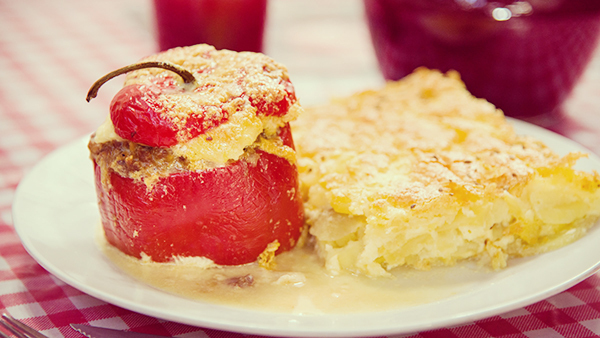 Some chefs tell that the preparation of the Rocoto Relleno is not that easy for starters. Legend says when you start boiling the rocotos the air in the kitchen might get hard to breathe! Deliciously! The Recipe to prepare a smoking hot Rocoto Relleno! To tame the heat of the rocotos, cut the top of each one and using a spoon scrape the seeds and ribs from the inside. Be very careful, and it´s wise to use gloves to protect your hands, and wash them well when you finish. DO NOT touch your eyes! Put the rocotos in a pan with water to cover, a tablespoon of sugar, bring to a boil, turn off the heat, discard the water. Add more fresh water and repeat this operation three times. Drain and cool the rocotos. Reserve. Meanwhile, in a saucepan over high heat, warm the oil, add the aji panca paste, beef and bay leaves. When cooked, add the onion, ¼ teaspoon sugar, salt, and pepper. Add the peanuts, oregano, olives, hard-boiled eggs, parsley, raisins, salt, and pepper. Fill the rocotos with this mixture. Accommodate in a rectangular or square Pyrex or baking pan. In a bowl, beat one egg with one can of evaporated milk, salt, and pepper, and pour over the rocotos. Beat two eggs until very thick and put a tablespoon over each rocoto. Then cover with the reserved tops. Bake for 15 minutes in a 350F oven. Serve with the potato gratin. To make the potato gratin: Butter a baking pan or pyrex, make one layer of potato slices, cover with queso fresco and a sprinkling of aniseed. Repeat three times. In a bowl whip the four eggs until very thick, add evaporated milk, salt, and pepper. Pour over the potatoes and cheese. Bake in a 350F oven until golden and thick. Recipes might vary between restaurants. That’s just a way to have a good Rocoto in a Peruvian Restaurant. However, the options can be dozens depending on where you go. Don’t miss the opportunity to try this delight with friends and family. See you next time; it was a pleasure to talk about Rocoto in Peruvian restaurants, and everything in between. See you at El Inka! PreviousPrevious post:Peruvian chicken near me: unveiling the Pollo a la Brasa Recipe!